One of the grandest adventure/survival films is one you’ve probably never heard of - The Red Tent - an oddball fusion of Italians and Soviet filmmakers with an all-star international cast and crew. It tells the true story of a failed Italian expedition to the North Pole via airship in 1928. The great Soviet filmmaker Mikhail Kalatozov directs his first and last English language film with complete authenticity. Other than the completely realistic arctic disaster story, the film is a powerful story of ambition, greed, international politics, heroism and cowardice. Kalatozov begins the story with perhaps the longest pre-credit sequence in film history. Before we even get to the snow there’s a 13-minute dream sequence from inside the head of General Nobile (Peter Finch), who fatefully led many of his crew to their deaths during the expedition. One by one the participants in the story appear in his subconscious in a makeshift psychological trial. It’s a manifestation of Nobile’s inner guilt and responsibility for the tragic events. Though it’s fascinating from a psychological perspective, as a cinematic device it’s awkward and confusing at the beginning and barely comes together at the end. But it’s important to get past this first scene because the film only gets better and more rewarding. The claustrophobia of the surreal dream sequence is released dramatically once Kalatozov gets outside into the open air where he works best. Intimacy is not Kalatozov’s forte. He needs big crowds, big machines and big scope to make his films. Italian General Nobile (Peter Finch) is in charge of leading an expedition to the North Pole. It was an age of nationalism and competition for international discoveries and achievements. Amundsen and Peary had already been to the North Pole, which Nobile has conspicuously missed out on. So Nobile’s mission serves not only to stake a claim for his country but personal pride as well. Kalatozov stages a wonderful farewell scene – not as grand as the farewell in The Cranes are Flying but majestic nonetheless. The addition to Ennio Morricone’s swooning score pushes Kalatozov’s epic style to even greater heights. The airship falters from the extreme cold and crashes to the ground miles from their target. The crash is horrific and directed with complete realism. With the crew stranded in the frigid and unaccommodating arctic it becomes a desperate fight for survival – finding food and shelter and salvaging the radio all become tasks of importance. The film cuts back and forth between the airship, the Italian basecamp where the news of the expedition has made the incident an internationally covered press story and a Russian expedition that hears their distress signal. Not only is it a fight for survival but a race to rescue them. The stunning visuals anchor this exciting flick. 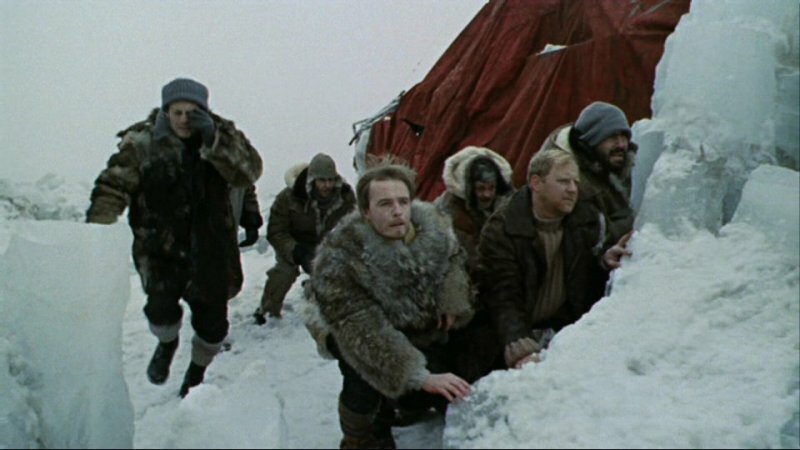 The on-location filmmaking in the desolate tundra is impossible to fake, and so I can only imagine how gruelling the shoot must have been. The expansive helicopter shots of the endless ice and snow isolate the characters and pit them against their environment, like Lean did in Lawrence of Arabia. Kalatozov increases the spectacle and scope when he introduces the Russian subplot. In fact, my favourite scene is when the amateur radio operator is tuning into the distress signal from the lost crew. The boy sits on top of his roof with the radio while the other townsfolk watching from below control the antenna with a kite. It’s a classic Kalatozov moment when he frames up the entire town from the roof whose attention is drawn to the one boy on top of the house. The image of the boy on the roof, which shows how mass communication can bring people from different cultures together for a common goal, is also an allegory to the collaboration of filmmakers from different cultures to tell this story. Kalatozov’s collaboration with the international talent is a fitting swan song for the Soviet master (see also I am Cuba and The Cranes are Flying). For a man who plied his trade as a virtual unknown behind the Iron Curtain, his grand emergence into the ‘Western’ world of filmmaking was also his final bow. The Red Tent was Kalatozov’s final film, as he died several years later. Enjoy.